The spacious inner Bailey is the setting for a range of activities and events: interactive history lessons for kids, wedding receptions, corporate gatherings, and break times, under the shade of its trees, for seminar participants. It is a place for serenades, theatre shows and other performances. 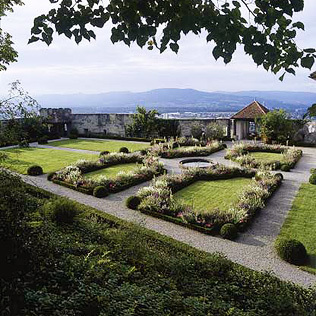 From the south and west bastions, enjoy the stunning view of the Jura mountain range and the medieval town of Lenzburg below. Take a rest in one of our two gardens. The large baroque garden, between Knight’s Hall and Bernese House, features flowerbeds and a pavilion. The garden was recently redesigned to the original sketches of Samuel Steck, dating back to 1780. The rose garden, adjacent to the museum, was created in 1900. Guests of the Café enjoy its idyllic patio and vistas.